Last Sunday, January 27, the Alternative Revolutionary Force of the Common (FARC), which is the political party formed by the Revolutionary Armed Forces of Colombia—People’s Army (FARC-EP) guerrillas, launched the presidential candidacy of Rodrigo Londoño, alias Timochenko, setting a new cornerstone in the political history of Colombia. 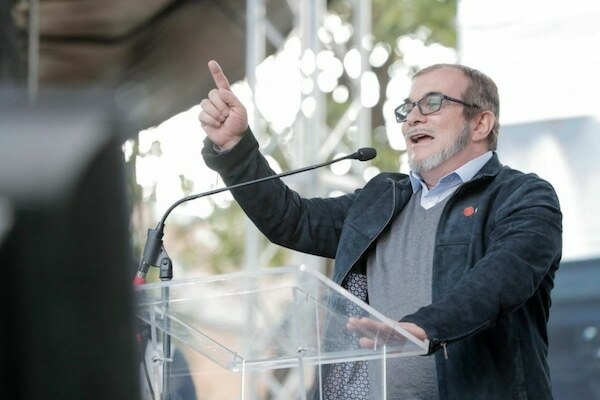 “In representation of my party, the Alternative Revolutionary Force of the Common, I commit to lead this transition government”, Londoño said in a rally held in the country’s capital, Bogota. After 50 years of armed struggle, the newly-formed political party will take its first step in the electoral arena with the former guerrilla commander as presidential candidate in the upcoming elections of May 27. Rodrigo Londoño Echeverri, better known by his nom de guerre ‘Timoleón Jiménez’ or ‘Timochenko’, is a cardiologist who was the third and last commander in chief of the guerrilla up until its dissolution in 2017 and the current leader of the FARC political party. “We know that people have lost faith in political movements or parties”, said Londoño in his campaign announcement speech. “That is understandable, since they have been deceived by them for too many decades”. “This is why the FARC is running in the elections. To break that pattern where politics are used to get rich with the money of the people”, he said. “The FARC was created to inaugurate a new form of making politics, by putting the common people at the center of the State”. He criticized inequality and upheld the work that is being done by social movements to uplift the poor and the working class. “The economy of the country is organized in such a way that big capital, banks, insurance companies, building companies, big landowners and mobs increase their wealth day by day”, as poverty and misery grow for the majority of the people. Those who tried to transform the country have been killed, Londoño said. But the FARC is willing to take the risk. Their militants are being killed already, as he denounced. The FARC leader criticized the government for the defamation campaign against the organization and the obstacles placed in the way of the Peace Agreements, before outlining the party’s propositions for voters. “Every Colombian has the right to physical and moral intergrity, and to a dignified life. Each and every one has the right to a Vital Subsistence Income, and we will guarantee it in our government”. “There can’t be anyone whose work isn’t recognized. The nation will guarantee that the domestic work carried out mostly by women and some men is recognized and paid. It is fair, the silent and invisible work of so many mothers has to be rewarded. We know that there can’t be peace if there is hunger, and therefore we will eradicate it”. “We believe it is basic justice to redistribute the product of national work more equally. If we do that, and fight the corruption that eats up the national budget (which experts estimate at around 50 billion Colombian pesos a year), we can and we must obtain the resources that the poor need to live with dignity”. He also added that “healthcare is a vital right, not a business for healthcare companies and private capital”, that “sports and recreation are rights, not luxuries”, and outlined a program for infrastructure work throughout the country. Finally, Londoño announced that the he will tour Colombia in order to promote the campaign and dialogue with people in order to develop the party’s proposals.